Time for another instalment of Shanghai Street Food! 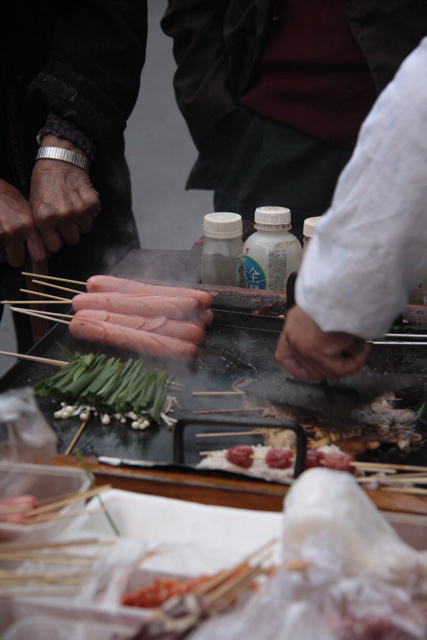 After being in Xi'an and eating every amazing thing on offer there I'm on a street food high - the more the better. 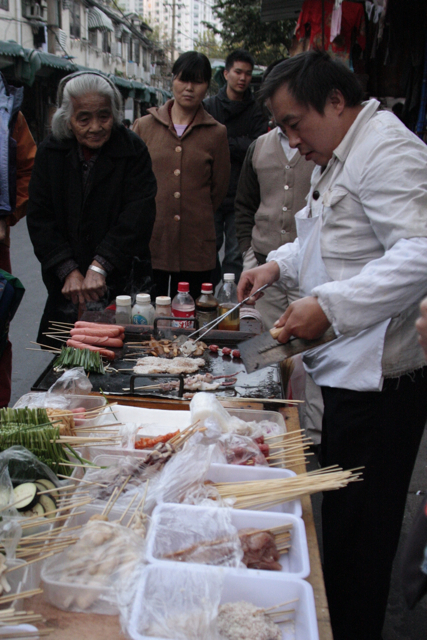 Street barbecue (shao kao 烧烤) vendors are a great way to have a whole pile of food you like cooked to lip-smacking perfection right in front of you on the street grill. Walk up, and choose any mouth-watering combo from the bamboo skewers of raw foods laid out on a long table - there are mushrooms (shitake, oyster, enoki), meats (pork, fish, prawn, squid, sausage) and vegetables (lotus root, spring onions, peppers), plus some unidentified tofu-type things. Now line up behind the other hungry punters to wait your turn grill-side. 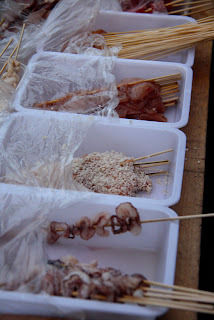 The vendor will beckon you over, put all your skewers on to the smoking grill plate, and then season them to your liking - any combination of salt, soy sauce, spice mix, chili and vinegar, shaken and splashed in a perfect symphony of flavours. He'll take what looks like a bricklaying trowel, and in fact, in all likelihood, is a bricklaying trowel, and with it press your meats firmly into the grill to really get those flavours mingling. The smell of the smoke mingled with the smell of spiced barbecuing meat is like torture for your hungry stomach while you wait. Skewers 2-6 yuan (30c - $1) each. Need more? For more street food than you could possibly handle in one sitting, take a look at the rest of the series!